I’ve seen this chart as a poster before, it’s pretty cool and ran across it today when a friend, Ben Wood, sent it to me. I just saw this for the first time on Sunday, at Cartel Coffee Lab! Nice to have a copy online for reference. This Chart can de found in the Specialty Coffee Asociation of America (SCAA) third edition handbook writen by Ted Lingle. It has been used by them for more than 30 years. It is a bit complicated to understand but so far is the best imterpretation of how to descrive coffee flavour. There is another way to analyse coffee flavor but uses a three dimentional model. I will find it for you guys soon. 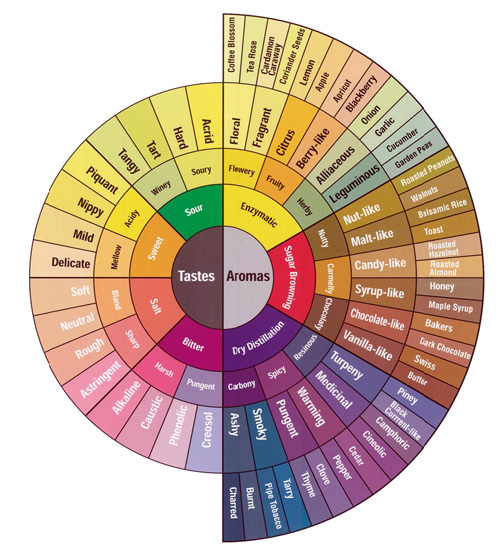 One really has to stare at this wheel while cupping for a number of times to get a grip on specific flavor definition. In the end it provides a common reference plane for comparing notes with others. Thanks for posting that chart, I had never seen it before! I would love to see a 3-dimensional chart, too. This one is used by wine people and is a bit simpler to understand, however terminology-wise will have many similarities. Look towards the middle of the page. I want to memtion that description of a nuance still a very subjective topic but I love the fact that we’re getting closer to communicate flavor in a more scientific way.